It doesn't have an exposure time (odd) and it's hard to tell if it would be usable in astrophotography. Maybe bright-dark cases in planetary imaging (night side of Venus, Saturn in methane band, Uranus rings in IR, Earthshine on the Moon...). CMOSIS got attention of some solar imagers as it offers big mono CMOS sensors with global shutters (2/3" and 1"). CMV2000 and CMV4000 will be available in GigE Baslers cameras in Q1 2012. 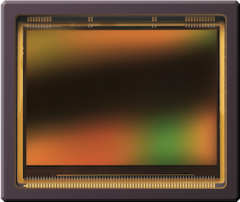 But CMOSIS did launch something new and very very big CHR70M - 70 mpix, 10000 x 7096 frame (3.1 x 3.1 µm pixels, ~35 mm diagonal, 3 FPS at full frame, more with ROI). It has FOV nearly as big as Atik 11000! Maybe it could be usable for some sky surveys? It would also give nice resolution at short focal lengths.